The coins were issued for commemorative purposes and were not intended for circulation, although they remain legal tender and must be accepted at Post Offices. The coins weigh 28.28 g (0.9092 oz troy) and have a diameter of 38.61 mm. 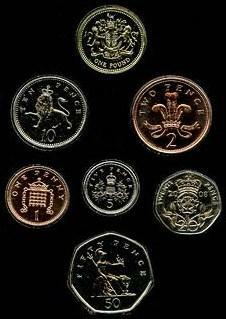 Twenty-five pence coin issues were discontinued after 1981 due to the prohibitive cost to the Royal Mint of producing such large coins with such small value. From 1990 the "crown" was revived as the commemorative five pound coin, having the same dimensions and weight but a value twenty times as great. 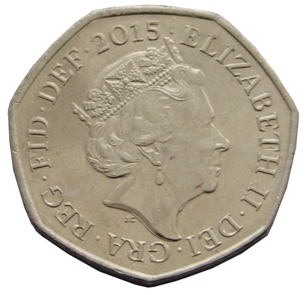 The two can be distinguished because the five pound coin is marked with its value. 1972 issue 1972: To celebrate the Silver wedding anniversary of Queen Elizabeth II and Prince Philip, Duke of Edinburgh. 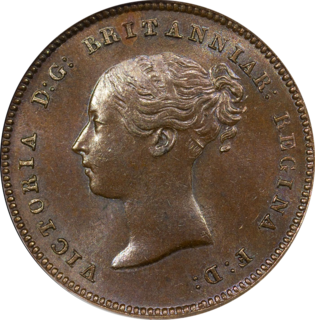 Obverse: The standard portrait of Queen Elizabeth II by Arnold Machin with the inscription D·G·REG·F·D· ELIZABETH II. Reverse: The initials EP crowned and with a floral garland, with a naked figure of Eros at the centre. The inscription reads: ELIZABETH AND PHILIP 20 NOVEMBER 1947 - 1972. This face was also designed by Arnold Machin. Both faces are encircled by dots. The edge of the coin is milled. There were 7,452,000 cupronickel coins and 100,000 silver coins issued. 1977 issue 1977: To celebrate Queen Elizabeth II's Silver Jubilee. 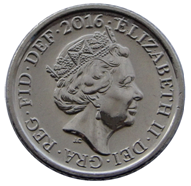 Obverse: A portrait of Queen Elizabeth II riding a horse, in a similar style to the 1953 crown celebrating her coronation. 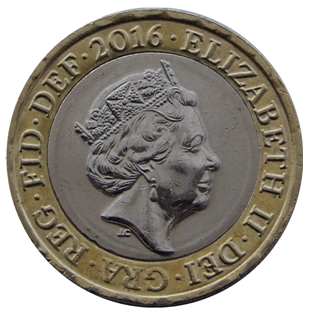 The inscription reads ELIZABETH·II DG·REG FD 1977. Reverse: A design showing coronation regalia. The Ampulla and Anointing Spoon used in the Queen's coronation are displayed crowned, and encircled by a floral border. These objects date from the 14th and 12th centuries respectively and have remained in continuous use. Both faces were designed by Arnold Machin. The edge of the coin is milled. There were 36,989,000 cupronickel coins and 377,000 silver coins issued. 1980 issue 1980: To celebrate the eightieth birthday of Queen Elizabeth The Queen Mother. 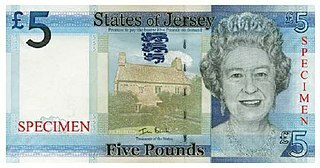 Reverse: A portrait of the Queen Mother surrounded by a radiating pattern of bows and lions, a pun on her maiden name Bowes-Lyon. The inscription reads: QUEEN ELIZABETH THE QUEEN MOTHER AUGUST 4th 1980. The reverse was designed by Professor Richard Guyatt. Both faces are encircled by dots. The edge of the coin is milled. There were 9,478,000 cupronickel coins and 83,672 silver coins issued. 1981 issue 1981: To celebrate the wedding of Charles, Prince of Wales and Lady Diana Spencer. 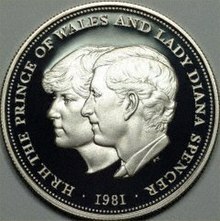 Reverse: A profile portrait of Lady Diana Spencer partially covered by a profile portrait of HRH The Prince of Wales, both facing to the left, with the inscription H.R.H. THE PRINCE OF WALES AND LADY DIANA SPENCER 1981. This face was designed by Philip Nathan. Both faces are encircled by dots. The edge of the coin is milled. There were 26,773,600 cupronickel coins and 17,000 silver coins issued.